The one sauce that you have during Thanksgiving is gravy. It goes on everything, right? The turkey, the potatoes, the dressing, and the sandwiches the day after. It can be the saving grace of a dry turkey, but Thanksgiving wouldn’t be the same without a deep, rich gravy. Gravy is actually pretty easy to make – you simply make a roux (butter+flour) and then slowly add some stock to it. Seasoned with salt, pepper, and some fresh herbs, you have a great all purpose sauce for turkey day. I do deviate from some traditional methods of making gravy in order to make it easier on me as I cook. 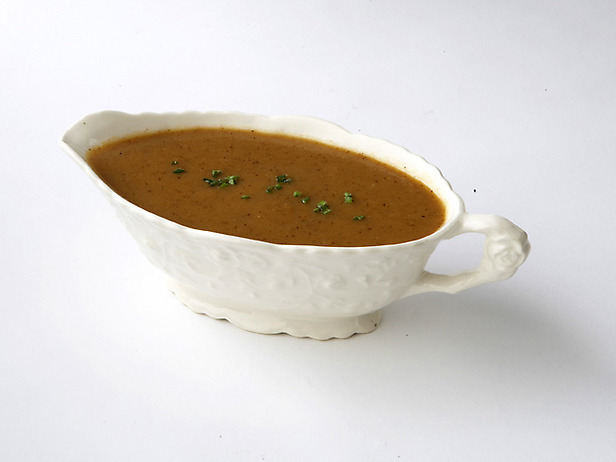 Many people make gravy out of the turkey drippings, or after the turkey has been fully cooked. Honestly, you can’t beat the flavor of that. But I buy turkey wings, take the giblets and roast them in the oven with some aromatic vegetables and then throw all of that in a pot with water to make a great turkey stock. This way you have the flavor of your roasted turkey, but the gravy is made and ready to go, so you don’t have to spend time making it once the turkey is out. Saving time is great, and if you’re organized, you can get all this done and just enjoy your holiday. The key is to make a great stock that is very flavorful. Once you have that, you’re on your way to a great gravy. Preheat your oven to 400 degrees. Put all ingredients in a roasting dish and let cook for about 45 minutes to an hour until deep golden brown. Remove from the oven. Keep the pan you roasted all the wings/veggies in because you will make your gravy in this pan. Put all the roasted ingredients into a stockpot and fill with water (maybe about 1-2 gallons worth). Let the stock come to a boil and then reduce to simmer. Skim off any foam or impurities that rise to the surface. Let cook for about 1.5 hours. Strain the turkey and vegetables through a strainer lined with cheesecloth. That way you will have a beautiful and clear stock. Get your previously used roasting pan and put it over your burner. Add the butter and let it melt. Add the flour and whisk to combine and get rid of any lumps. Whisking will ensure you don’t have a lumpy gravy. Slowly pour in your hot turkey stock, ladle by ladle and ensure complete combination with the roux before you add the next batch. Bring the gravy to a boil, and it will start to get thick. Keep whisking until it reaches your desired consistency. At the end, add the sage and black pepper and season everything with salt. Tip 1: If your gravy has lumps, whisk it. If it still has lumps, strain it. You’ll be fine. Tip 2: If the gravy is too thick, just add more stock. If you ran out of stock, add water. Tip 3: If the gravy is too thin, whisk together 1 tablespoon of cornstarch in 3 tablespoons of water. Add that to the liquid and let come to a boil. It’ll thicken up nicely. Enjoy your gravy, people! You can make this a few days in advance too and it’ll taste great! Also, I’ll have a post on Tuesday where I answer all your questions, so if you have any, please post them! ← Thanksgiving Week! It’s desert time – Pumpkin Pie! AHHHH! I can’t take it! Tgiving week at Vivek’s looks so good! i would eat this with veg stock for sure! my thanksgiving question is: what would be a great cocktail with thanksgiving dinner? i don’t want something too heavy because there will be so much food!